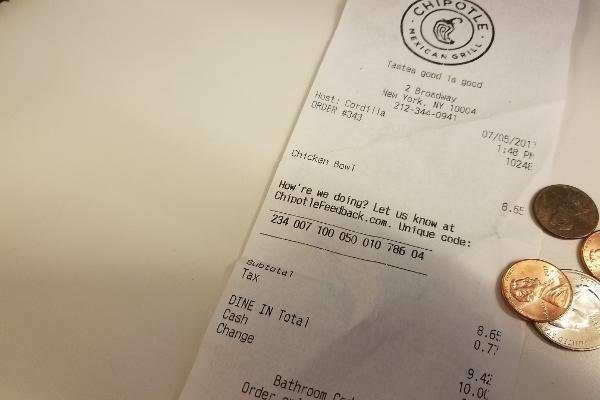 A millennial returns to Chipotle. 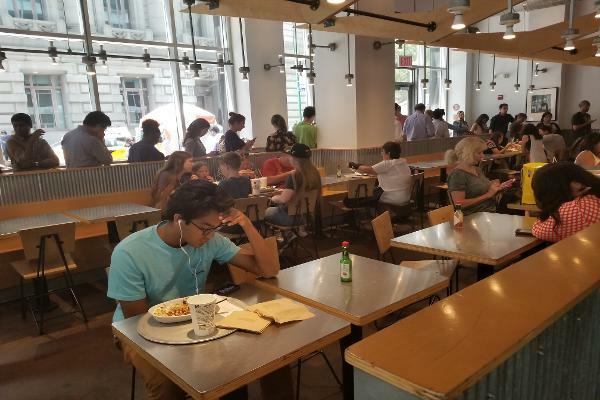 When I visited a Chipotle Mexican Grill Inc. (CMG - Get Report) in New York City on Wednesday afternoon, it was not obvious that the Mexican food chain had just upped its prices 5% in the city this summer. 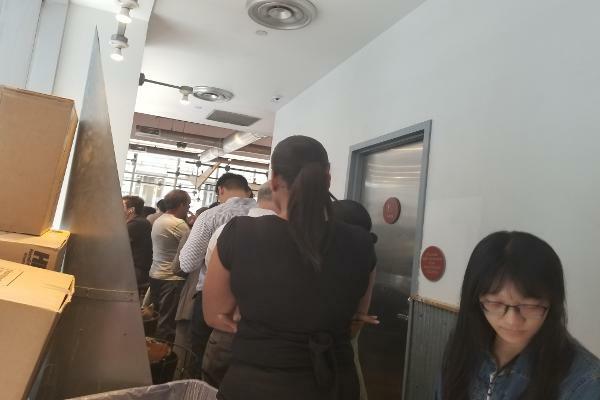 The location at 2 Broadway in Manhattan's Financial District had a line for food that snaked throughout the restaurant to the other side of the building, visibly showing the progress Chipotle has made since a widespread outbreak of E. coli left many customers wary of the food in 2015 even after the federal Food and Drug Administration gave the all-clear. I had not been to Chipotle since the outbreak that caused the company's shares to fall 21% in 2015. They are up more than 10% in 2017 to date. But, Chipotle has been hit with some bad news this summer, including the revelation of a security breach in May and the announcement of higher advertising and cyber security costs in June. In April, Chipotle also raised prices in 440 of its 2,300 stores nationwide by about 25 to 30 cents per meal. A month later, the company said that it was raising its prices in its 58 locations in New York City. 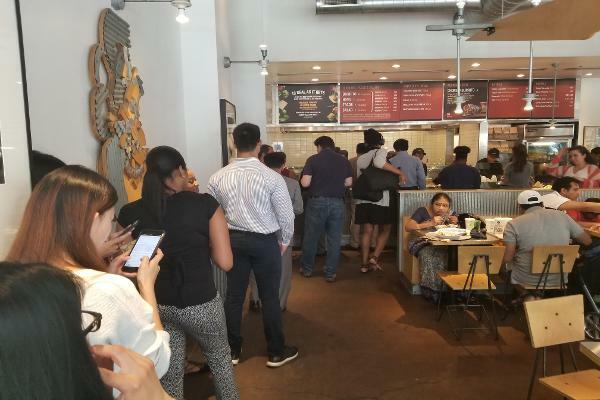 Despite higher costs and long lines, New York patrons said they still eat at Chipotle. "I think it's worth it," Louis Ruis told TheStreet. "And the line moves pretty fast." Cristina Crespo agreed. She said she likes the flavor of the food. "If I have time, I come," Crespo said. "If not, I usually order online. I think it's faster that way." Chipotle's shares rose 0.2% to $413.71 by Friday's close. Here was my experience returning to Chipotle. 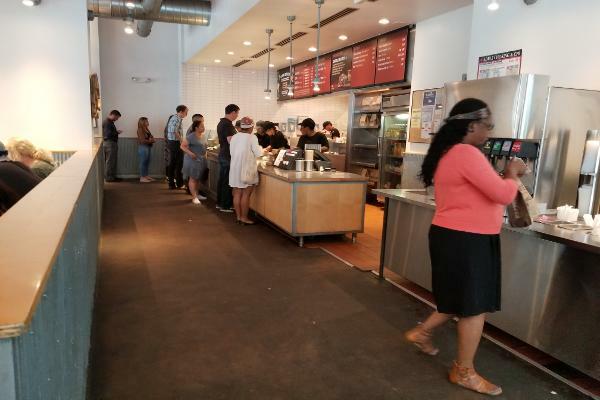 I arrived to Chipotle at 1:20 p.m. on Wednesday, and the restaurant was still busy. I had to weave my way through the restaurant to make it to the back of the line. By the time I found the end, I couldn't even see the front. The line gave me plenty of time to take in my surroundings. It ended near a second entrance. I was glad I didn't come through that door. 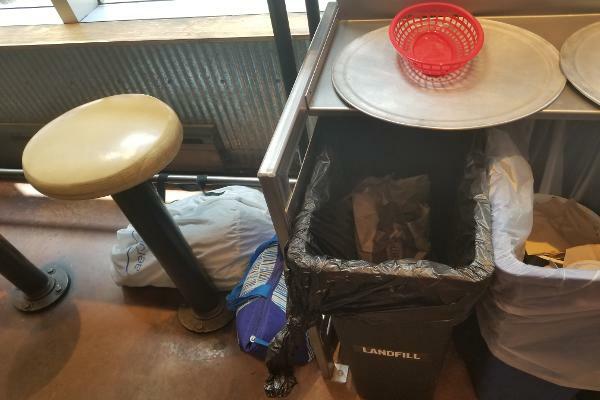 Anyone who did was greeted with trashcans and old metal pedestals where patrons place dishes after they are done eating. I suppose it was not too pleasant having to wait in the midst of all that either. There were also a lot of cardboard boxes, which with these large windows were visible even from the street. This place must lack storage. On the bright side for Chipotle, since one of the boxes was marked burrito bowls, it looked like they were selling quite a few. While waiting, I run into a friend, who was making a beeline for the back door. I told him I am writing a story on Chipotle, and he said that the 2015 E. coli outbreak does not keep him away now. 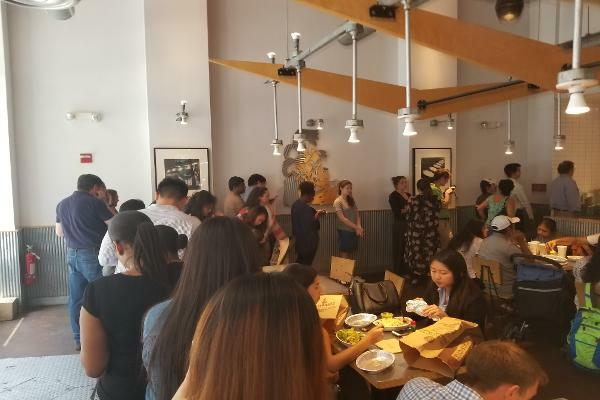 He added that he was actually on his way to a Potbelly Sandwich Shop (PBPB - Get Report) — it was the length of this line that stops him from eating at Chipotle. 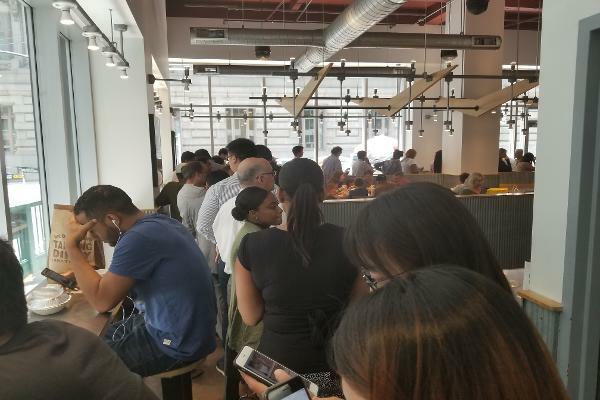 An overwhelming majority of the people in the restaurant were business professionals and likely taking their food back to work, so despite the long line, there were plenty of seats open in the middle and at the bar-style seating along the windows. We were moving, but yes, I was still waiting. Two large unattended bags sat on the floor, as I waited in line. Crespo noticed them, and after seeing no one around them, she alerted a Chipotle employee. "I'm wondering if I should leave," Crespo said. "This is New York after all." 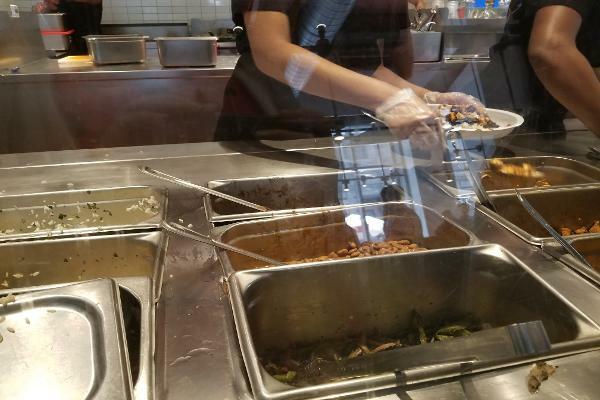 A Chipotle employee came to look at the bags a minute after she returned. He immediately grabbed both of them and took them to the back of the restaurant. 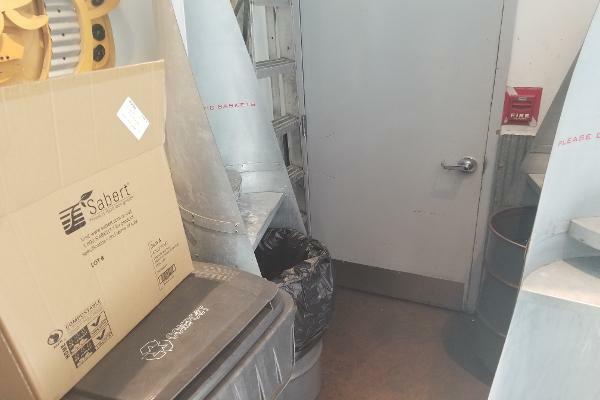 Crespo remarked that the employee does not take safety precautions before touching the bags. A man returned from the restroom a few minutes later looking for his bags and retrieved them at the counter. At least I was facing the right direction at this point. The restaurant had an industrial feel to the place. 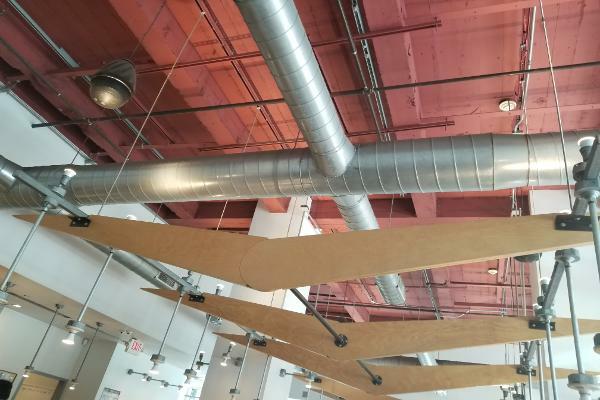 The floors were cement, the venting was visible, the wall decorations resembled gears and there was metal everywhere. While it definitely had an urban feel, I could not help but think the industrialism feels odd in the Financial District of Manhattan. 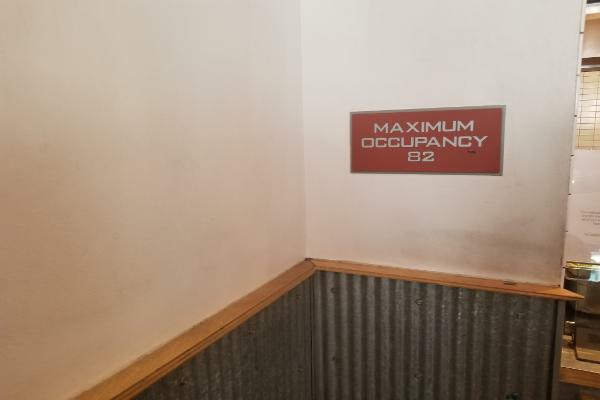 Given that the tables in the middle of the restaurant sit 40 alone, there were definitely more than 82 people in the space. 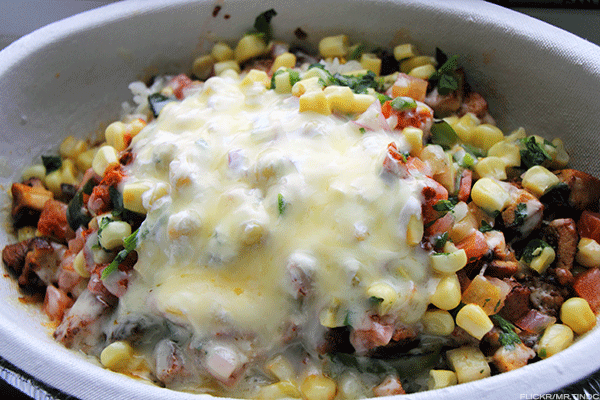 Chipotle markets itself as serving "food with integrity." In 2015, some locations did not serve carnitas because the company learned one of its pork suppliers did not meet the chain's animal welfare standards, according to the link on this flier. Its replacement suppliers, Karro Food Group and Danish Crown's Tulip Food Co., did meet Chipotle's standards except that U.K.-based partners follow European standards, which allow the administration of antibiotics when needed to keep an animal healthy. 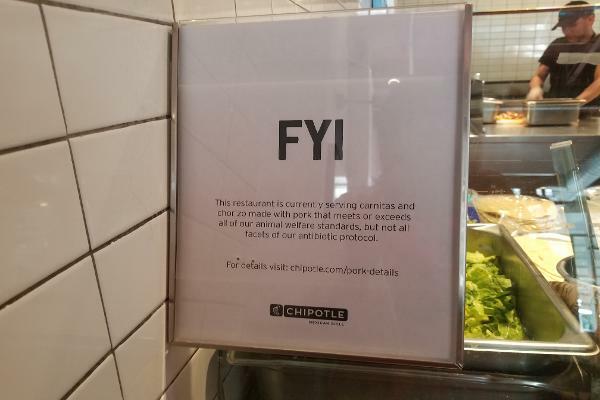 It was nice to see Chipotle was attempting to be transparent about its ingredients. By the time I got up to order, I had almost forgotten what I was doing there — Oh yeah, I was there to eat. 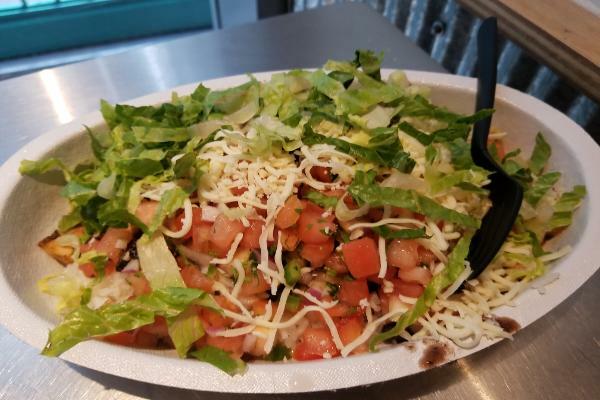 But Chipotle's menu is limited and simple, which made it easy order quickly. The menu also conveniently provided dietary information, as well. But I definitely decided to pass on the guacamole — $2.45, seriously? 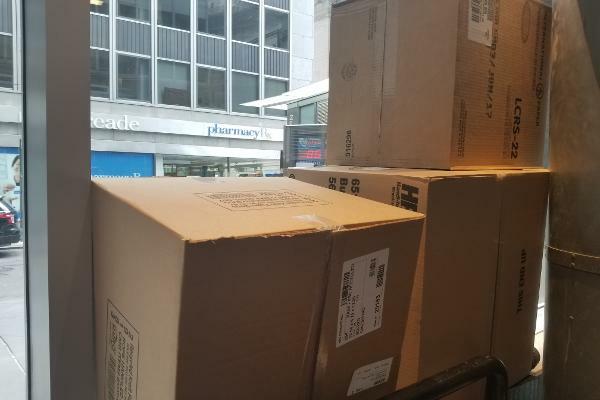 Given the number of customers in line, it made sense that the employees wanted to get through the orders as quickly as possible. There hands worked quickly, as they threw the ingredients together and passed it onto the next employee in the assembly line. They were visibly rushing, and no employee spoke more than five words to me: "Do you want anything else?" It made the experience a bit impersonal. 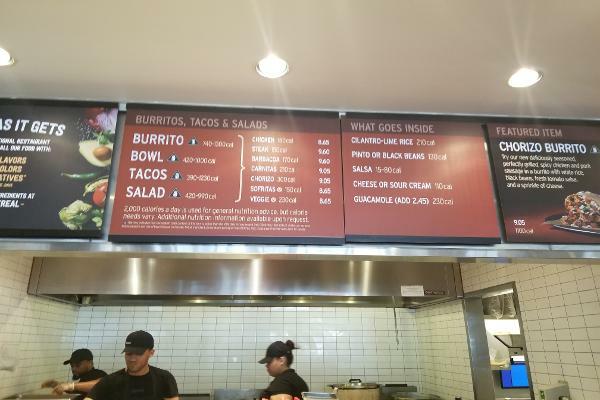 The price for just the burrito bowl with chicken was $8.65, and that was the cheapest of the meat options with a veggie option being $1 less. With tax, it came out to $9.42. In terms of fast-food lunches, this was definitely on the high end and not exceptionally quick. Given how tight it was with the line and the bar stools on the outer edge of the restaurant, this space looked huge. It seemed like there could be a better use of the area here. Maybe there was: a dance floor because you finally had your food. The half-hour wait was long, but the food was spicy and filling. Plus, that beautiful blend of color surely would make for a great addition to an Instagram (FB - Get Report) or Snapchat (SNAP - Get Report) story. Was it worth nearly $10? Not exactly all things being considered.